Looking for a fun and uplifting way to help a child understand why another child acts so differently? Understanding Charlie does just that. This is a story of one family’s love for their wonderfully made child, a four-year-old boy with autism and sensory issues who is difficult to understand. Told through the eyes of Charlie and his older sister Amelia in a fun, rhyming style, the wonderful illustrations show that while Charlie may act differently, he is like other children in so many ways. 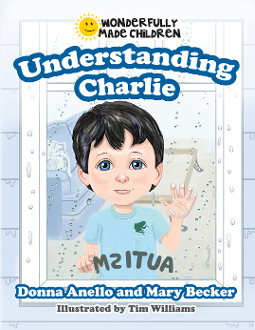 Discussion questions are included at the end of the book to encourage children to share their thoughts and feelings about Charlie and his experiences. It’s also a great resource to introduce the concept of inclusion for all children, whether their behaviors are difficult to deal with or at times inappropriate. The youngest official reviewer, Lana who is five years old, shares, “It was great! I give it two thumbs up! Can we read it again tonight?” When a child says that, it’s obvious this book can make a difference in the lives of many children. So, what are you waiting for? Scroll to the top of this page and buy the book to read with your wonderfully made child today!